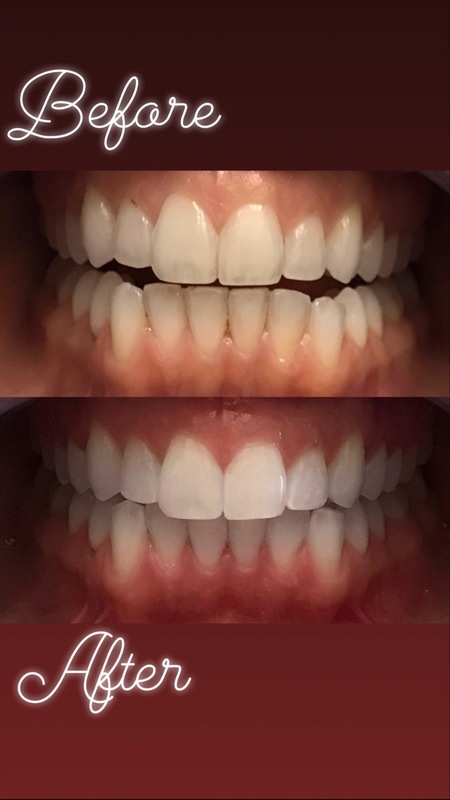 Is professional Teeth Whitening painful? No it’s amazing! Is professional Teeth Whitening painful? No it’s amazing! Is professional Teeth Whitening painful? No it’s amazing! Hi loves! It’s officially been two weeks since my in office Zoom teeth whitening procedure at my dentist’s office and I’m obsessed! I wanted to write a post to share my experience with you plus a few added tips and tricks. I’ve tried a multitude of at home whitening solutions that had mild improvements on my normal teeth staining from coffee and red wine. Last time I was at my dentist, LA Dental, I noticed that they offer a peroxide based in office treatment called Zoom bleaching. I’ve heard rumblings about teeth whitening being really painful, thinking it may not be the best choice for my sensitive teeth. I decided to try the zoom bleaching despite my apprehension because I really wanted to whiten my teeth before the wedding. I whole heartily trust my dentist and she said it wouldn’t be painful so I made an appointment and prepared myself. I drank my favorite very green smoothie pre whitening because I was instructed not eat any colored or staing foods post appointment. The procedure performed by my hygienist consisted of covering my gums, painting my teeth with the whitening solution, and exposing them to a special light. The whole process took a mere 30 minutes and was painless!! I looked in the mirror right after the treatment and I was shocked! The results were immediate, the photo above depicts my same day results! Post treatment I was able to drink water and eat light colored food with only a touch of occasional sensitivity. This treatment makes teeth really susceptible to staining for the first 3 days after treatment so it’s very important to avoid staining foods. I’m not gonna lie, it was a touch difficult giving up all of my favorite dark colored morning and evening beverages. I substituted sparking water for all of my normal beverages and it really helped normalize my daily rituals. I personally avoided eating colored foods or drinking colored beverages for a week just to be certain that my teeth would stay pearly white! I would 100% recommend this treatment to anyone who wants whiter teeth! My dentist charges $150 for the in office Zoom bleaching and I plan on doing it once a year if need be. If you’d like to book with my dentist LA Dental located in Korea town click the link below to make an appointment. Feel free to comment below if you have any questions! !